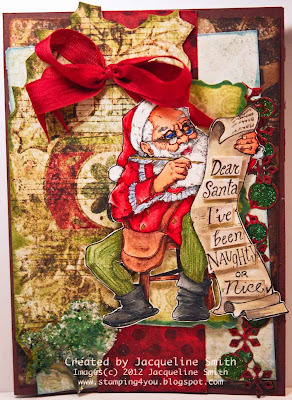 Again I colored the sentiment using Tim Holtz distress reinkers and cut them out individually to place on the Christmas list. I then added some Top Boss reinker along with some Age Hunter Embossing Enamel, heat set, while it was still hot added some Fresh Green & Green Crushed Glass Glitter all Fran-tage' Elements by Stampendous in the left hand corner. I added a Cherry Cobbler Seam Binding bow on top of the ornament on the paper. We want you to make a card, project or whatever to get a head start on your Christmas Cards! Just upload a creation that follows this week's challenge to your online blog or gallery. Then leave a link to your project in the linky widget at the bottom of this post. If you upload to online galleries, please also use the tag or keyword LRSBC61. Our challenge is open to everyone, you can use any stamps and products that you would like, and you can enter as many times as you want. The linky entry widget will close at 9PM CST on Monday, July 22nd so all entries need to be in before then. We also have very special GUEST SPONSOR this week! Guest Designers receive a 20% discount on most all items listed in our store during their term.We will also provide a link to your blog for 1 year!! Only rule is to use current images from stamp companies we carry in the store for your challenge projects and to have fun! We will contact the winner the week of the July 23rd! ** Be sure to Play Along in our - Weekly Blog Candy Giveaway! Just hop along with our Design Team in a Mini Blog Hop for the chance to win the hidden prize! Start the hop here on ourSensational Sunday Inspirations post **Pin It Now! What a cute Santa image, and I bet IRL he looks great with his Twinkling Cloud beard! Oh this is so super cute with Santa checking his list, I love it! Your card is bautiful. Love the cute Santa image. You are so talented Jackie! This is amazing as always. The images on all your projects just pop! Beautiful!